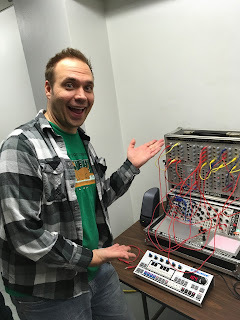 Yesterday I visited the Twin Cities Synth Meet, and got a chance to try out a few things. I also took a few photos - of course, asking for ultra-cheese Facebook faces! This guy (can't remember the name, because I'm terrible with names...) had some interesting stuff in a small-ish system. 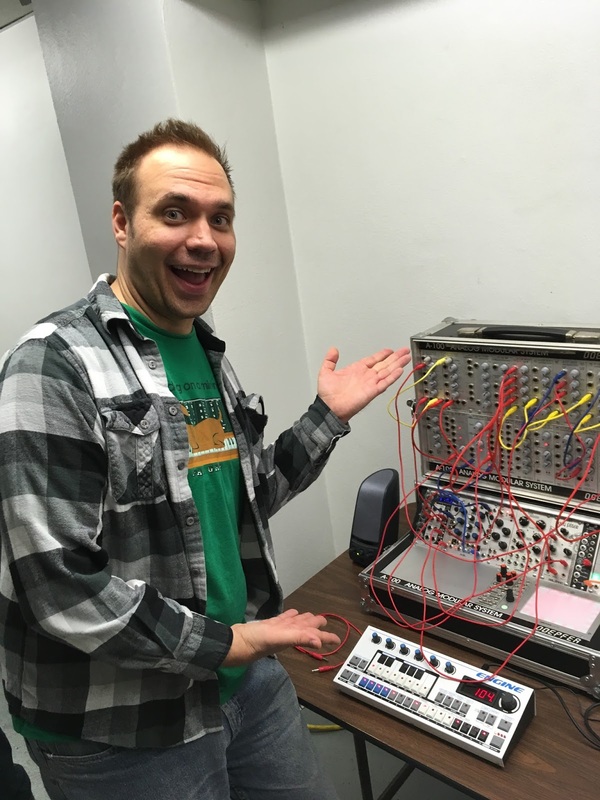 Among the modules that caught my attention were a HackMe Vectr, a Blue Lantern quad quantizer, and a stand-alone Social Entropy Engine MIDI Sequencer. I like that sequencer a lot. It seems to be a quick-work machine, supports a MIDI drum channel (so it would be a perfect match for a DRM, for example), looks like it support poly-rhythm sequence lengths and holds a metric ton of sequences and stuff. And it is small, and clean looking, and completely not-computer-like. I'm gonna have to see if this one might fit in my performance rig. But I'll need to do some reading, because I'll want to support both manual and keyboard entry, I'll want to do partial (non-bar-based) switching and lots of modulation control. On the surface, it looks like that should be a go, but I need to investigate before diving in. At $665, it's not an off-the-cuff purchase. But on the surface it looks really, really good.